One of my chosen artists for my Artist Studies is Andy Warhol. I have always liked his Silkscreen Prints, especially his famous Marilyn Series (1962). Therefore I wanted to recreate a similar image but using Photoshop. 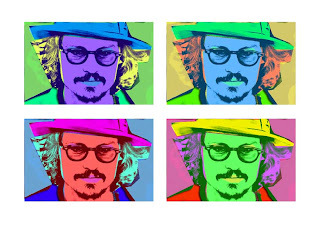 I chose Johnny Depp because he is one of my favourite celebrities and actors as was Marilyn Monroe for Warhol. Original Image that Effects are based on. 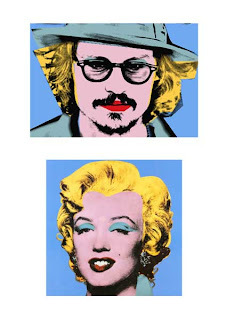 Image 1 - Colours made to Match Warhol's Famous Marilyn Silkscreen (Blue). 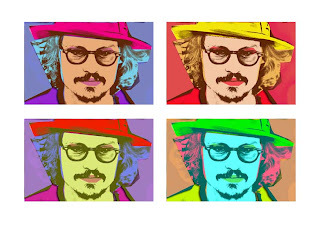 Photomontage of Different Versions of Johnny Depp. To recreate the posterized shadows, I selected RGB on Channels Palette and made a new channel - Alpha Channel. I altered the edge detail by using the High Pass Filter. Then, I adjusted the Levels to created high contrast. This left me with a posterized black and white image. Next, using the brush tool I painted away unneeded areas, to give me a crisp and smooth image. To make the base detail I inverted the image, selected it, placed it on a new layer and filled it in with a base colour. For each area of colour e.g. Face, Clothing, Sky etc. I created a new layer and using the Lasso Tool I drew roughly around the shape, then filled it in with the Paint Bucket Tool. Each time I had to make sure the Base layer was on the top. Lastly to create different versions I use the Hue/Saturation Adjustment and saved each version.